"Music & Magic Concert" Total: 60 min. Part 1. ~ Fun and Mysterious Magic Show ~ Approx. 30 min. A show which proceeds through conversations with kids will take them on a mysterious world through the power of magic and imagination. Household materials such as books, ropes, water, vases, papers will be used in this show. A magic can at times grow large upon children's imagination, which will in turn become a wonderful experience for the participating adults. Part 2. ~ A Magical Concert with Instruments and Songs ~ Approx. 30 min. 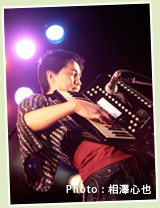 A world of mysterious music begins with piano and melodica. What kind of sound can each instrument create? What kind of potential does each instrument have? We will examine these questions while enjoying the music performance. We will have an improvisational rhythmic ensemble after playing rhythmic games with children. Songs include Japanese traditional songs, Japanese folk songs and tribal songs from all over the world, which will be performed with a unique arrangement. 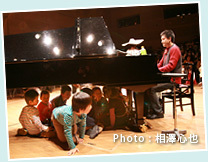 "Playing Piano Will Become Fun! Piano Accompaniment Seminar"
To those who are "not good at piano," "can't read music," "can't take care of the children while playing," "want to play more freely," or "want to overcome problems," I will introduce the first step in playing cool and easy accompaniment which will make piano enjoyable. "Singing Will Become Fun! Voice Seminar"
We will have fun with voices, songs, music by playing games that utilize voice. Songs that are loved by kids or songs that teachers like are arranged into easy and relaxing music that we will sing. We will examine the fascinating nature of music by experiencing what sound can be created from human voice. "Seminar on Easy and Orthodox Magic That Can Be Used in Child-Care Starting Tomorrow"
Magic can be a bridge that can be used as a nonverbal communication tool with children. By incorporating your original story and direction to an easy magic trick, you will master an original magic that can be used the rest of your life. The trick and the direction will vary depending on age. We will open up the path to becoming a magician while experiencing the mysterious world that will fascinate kids as well as adults. Can be picked from above, just 1 of them or can be a combination of 2 or 3. Possible to do a seminar for the first half and a concert for the second half. Piano, microphone, small table, projector (depending on the number of participants), PC with Microsoft Power Point installed.